Anxiety is a relatively common mental health disorder. According to the National Institute of Mental Health, 40 million American adults are affected by anxiety disorders each year. Not everyone who experiences anxiety has a clinically diagnosable anxiety disorder; anxiety is a common, normal response to fearful and stressful situations. While medication can often ease symptoms, some herbs, such as chamomile, can also help to lessen anxiety. Always consult your doctor before taking herbal supplements. Anxiety can manifest in a number of different ways. According to the National Institute of Mental Health, some of the more common symptoms are irritability, excessive worrying, sweating, shaking, shortness of breath or headaches. Anxiety disorders include specific phobias, which are fears of specific places or things, panic disorder, which is characterized by panic attacks, obsessive-compulsive disorder, which exhibits itself through obsessive, ritualistic behaviors and thoughts, and generalized anxiety disorder, which is a state of general fear, worry and tension. Chamomile is an herb that has been used in traditional and herbal medicines for thousands of years. According to the University of Maryland Medical Center, the ancient Egyptians, Romans and Greeks used chamomile for its multitude of physical and mental benefits. Among its many other uses, chamomile may help to reduce anxiety, ease insomnia, calm upset stomachs and soothe minor burns. Chamomile is commonly used in capsule form and in calming tea preparations for promoting sleep, relaxation and anxiety and stress relief. There are two types of chamomile: German and English. The German chamomile plant is more popularly used in the United States, according to the National Institute of Health Center for Complementary and Alternative Medicine. Both appear to have the same properties, although they are two distinct species. 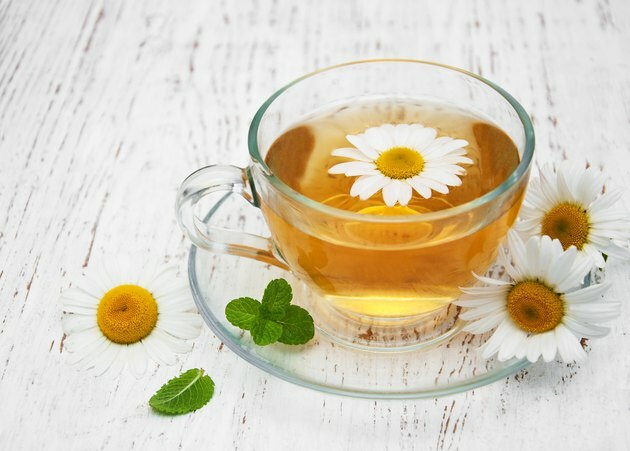 According to a 2009 study by University of Pennsylvania researchers published in the "Journal of Clinical Psychopharmacology," chamomile capsules appear to have a calming effect on anxiety symptoms. Chamomile tea may also offer similar benefits. You can make your own calming tea by steeping 2 to 3 tbsp. of dried chamomile in a cup of boiling water for 10 minutes, according to the University of Maryland Medical Center. Although chamomile is considered to be one of the safest herbs you can take, people with asthma should avoid chamomile as it can exacerbate their symptoms. According to the University of Maryland Medical Center, pregnant women should stay away from chamomile due to the risk of miscarriage. People who are allergic to the aster, daisy or sunflower family of plants may also have an allergic reaction to chamomile.